Disclaimer: Projected dates for reference. Events are subject to change. Refer to @Forzamotorsport channels for updates. Click the ^ symbols to jump to sources or discussion threads. This week we’ve got the latest events happening in both Forza Horizon 4 and Forza Motorsport 7, a look at the latest Bounty Hunter event in Forza 7, along with a special surprise for our own Johniwanna courtesy of our friends at PTG. Let’s go! "New #Forzathon events kick of the new happenings in Forza Motorsport, including a chance to win the Cyber Driver Gear in our “A Fine Vintage” event, as well “Along the Beach” where the prize is the 1988 Chevrolet Monte Carlo Super Sport Forza Edition." "Over in Leagues, Series 4 wraps up this week, and we kick over to a new Season this weekend. The new Season is dubbed “Keeping Pace” and here’s a look at what’s coming in the season’s first series." "The next refresh for Forza 7 hoppers is coming next Thursday"
"As we announced on our January edition of Forza Monthly, we’ve got a photo contest happening right now in the Forza community with the cars of the Barrett-Jackson Car Pack. From the Shelby Monaco King Cobra to the Plymouth Hemi Cuda Convertible, take your best shot of any the cars from January’s car pack and we’ll pick our favorites to be featured on our next edition of Forza Monthly. Head over to the Forza Forums thread to read all about how to get involved and post your entries." "Starring the 2009 Lotus 2-Eleven on Road Atlanta Full Circuit, this Rivals event is a test of car control (especially on corner exits) on one of the best high-speed tracks in the game. Personally I’ve managed a 1:30.260 and am currently fighting for the sub-1:30 that I know is in me. A quick glance at the event’s overall leaderboard sees ForzaRC great G2 Laige at the top of the sheet with a stunning 1:25.714, one of just six times in the entire world in the 1:25’s. Here’s a reminder of the rewards that are up for grabs based on your final position on the leaderboard:"
"We had a great moment in this week’s edition of #ThumbsUpThursday on the Forza Mixer and Twitch channels. Our own Johniwanna was surprised by Forza community group PTG with a gift T-Shirt signed by members of the PTG family from all over the world. During the stream we welcomed PTG Monk and Costlesscape92, who made the trip to Turn 10 Studios to deliver the gift." "Join us today for another great edition of #ForzaFriday. In Forza Horizon 4 we’ll be checking out the two new Car Pass cars and hitting some Team Adventure; in Forza 7 we’ll be back in ABCS and Cycled Production before we hit the Nürburgring for our weekly Random Ring Race. Watch it live starting at 3 p.m. Pacific over on the Forza Mixer and Twitch channels. See you then!" "A quick reminder that the next episode of Forza Monthly is coming on February 4. Look for more detail on the show in next week’s edition of the Week in Review." In today’s edition of the Forza Week in Review we’ve got a look at the latest happenings in Forza Horizon 4 and Forza Motorsport 7, we check out an excellent track guide from a pair of ForzaRC greats, plus we set you up for the February edition of Forza Monthly, and more. Ready, set, go! "In Hoppers, the new rotation brings a sense of history to the racing with some classic racing divisions." "In Leagues we’re about to begin Series 2 of our “Keeping Pace” season. Here’s what’s going live this weekend"
"Here’s the latest crop of #Forzathon events:" "Update - We have removed the “February Carpass” #Forzathon event from the current list of active #Forzathon events. This is due to a mistaken requirement that players use Formula Drift cars for one part of the event. Formula D cars are not part of the Forza Motorsport 7 Car Pass. We regret the error." "If you’re a Forza Racing Championship fan or a longtime Forza community member, chances are you’ve heard of the names Zermatt and Daveyskills. These community legends have been around since the earliest days of Forza, dominating leaderboards the whole while, and both made impressions in last year’s ForzaRC campaign. Now they’re teaming up in a different way. A recently released video on Zermatt’s “Zimdog Tuning” YouTube channel features a track breakdown by Daveyskills of one of his favorite Forza 7 tracks – Sonoma Raceway Full. In the video, Davey offers insight into how to tackle this challenging Northern California circuit, full of elevation changes and tricky corners." "We’re getting geared up for the next episode of Forza Monthly, airing on Monday, February 4 at 11 a.m. Pacific." ... "We’ll be diving deep into the February update for Forza Motorsport 7, which includes force feedback updates, multiplayer loading improvements, and some new stuff that we can’t wait for you all to see. We’ll also be showing of the winner’s of our Barrett-Jackson Car Pack photo contest and more." 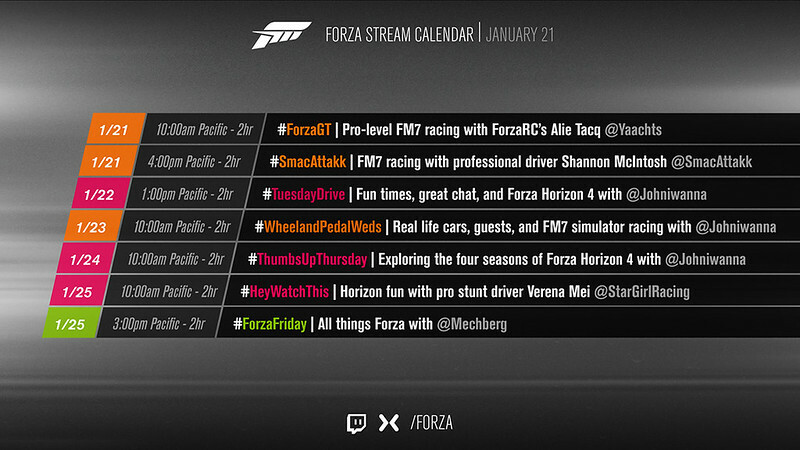 "In addition to the Forza Monthly fun, here’s a look at the rest of the streaming week on Forza channels. As you can see, Monday will be a busy day of shows, with both pre- and post-game shows surrounding Forza Monthly. Enjoy the lineup and we’ll see you next week!" "In Leagues we’re about to begin Series 2 of our “Keeping Pace” season. " "We’ll be diving deep into the February update for Forza Motorsport 7, which includes force feedback updates, multiplayer loading improvements, and some new stuff that we can’t wait for you all to see. We’ll also be showing of the winner’s of our Barrett-Jackson Car Pack photo contest and more. Join us for the show live at 11 a.m. Pacific on Mixer, Twitch, and YouTube!" "Chris Esaki dropped in for a chat about the February update for Forza Motorsport 7." "Hot on the heels of Forza Monthly, we released the February update for Forza Motorsport 7 on Tuesday of this week. In addition to features like improved multiplayer loading and a Force Feedback update for wheel users (not to mention a new Spotlight Car in the form of the 2017 Ferrari GTC4 Lusso), February saw the painting community get some love with the introduction of some new lighting scenarios in the paint space. Now, painters have four lighting conditions to choose from when previewing designs on their favorite cars – Ambient Light, Ambient Dark, Sunny and Sunset. The update also adds Forzavista and Photo Mode functionality so players can explore their designs and share quicker than ever." "Forzatographers also have a new new space to practice their art in the form of the Forza Garage, accessible from the main menu. By entering Forzavista from the main menu and then going to Photo Mode, players can now explore the entirety of the garage space. Try it for yourself and see what interesting shots you can compose." "This week we announced a new livery contest to take advantage of the new painting features introduced with the February update. We’re asking our talented livery creators in the community to create a “Forza Monthly” livery on the (non-DLC) car of their choice. The winners will receive some cool in-game goodies, as well as a feature spot on the March edition of Forza Monthly. In addition we’ll be sending out the winning car and livery to all Forza 7 players after the top winner is chosen. For all the details check out the thread on the Forza Forums." "Last month we unveiled the Barrett-Jackson Car Pack for Forza Motorsport 7 – a collection of eclectic autos that are just as comfortable fetching high prices on the auction block as they are tearing up the asphalt. Last month our own Johniwanna headed down to Scottsdale, AZ, for a look at the real-life Barrett-Jackson auction. What he discovered was one of the largest automotive events in the world, full of incredible collections, and interesting characters. Here’s a look at how John’s trip went: https://youtu.be/sXUDprK8ZVY"
"This weekend, we switch over to the final series of events in our Forza Motorsport 7 “Keeping Pace” season. Everyone who competes in the season will be rewarded with the 1968 Dodge Dart HEMI Super Stock Forza Edition." "Over in the FM7 hoppers, we’re switching things up with trucks, GT cars, and supercars"
"If you’re a fan of automotive photography, you’ve probably seen Larry Chen’s work. With a huge following on Instagram, Chen is a celebrated commercial automotive and car culture photographer and he’s got a cool contest happening right now that every Forzatographer should check out. Forzatography Central is hosting #LarrysChallenge, a contest for Forza players to try and recreate a real-life shot of Larry’s in either a Forza Motorsport or Forza Horizon game. Check out the post on Instagram for more on how to get involved and good luck to all entrants!" "The latest Rivals qualifier for the Le Mans eSports series is now live in Forza Motorsport 7 (look for it under the Featured Events channel as “LMES Qualifer Rd 5.” This time around you’ll be tackling the 2014 Audi #2 Audi Team Joest R18 e-tron quattro at Sebring Full. Enter and set your best time in the event for your chance to qualify for the 24 Hours of Le Mans Super Final in June. This is the second-to-last qualifier event before the finals event – so get your best time in now! For more on registration and rules check out the Le Mans eSports site." I’d like to lead this week’s edition of the Forza Week in Review with half of a story. This is a story of a young woman named Akane, daughter of Brian Beardow, who is the founder of the wheel company fifteen52. Akane was recently diagnosed with Acute Lymphoblastic Leukemia, a common form of cancer among children and young adults. Since the diagnosis, Akane has been undergoing chemotherapy treatments and her parents have understandably re-adjusted their lives to focus on their daughter’s care. Pro driver and Forza streamer Verena Mei (who hosts her #HeyWatchThis show every Friday on the Forza Mixer and Twitch channels) is friends with the Beardow family and was the first to alert the Forza Community to Akane’s journey. Working together with a very special collection of Forza community members, Verena has arranged a special tribute to Akane, which will appear in next week’s edition of Verena’s Friday show. In the interest of not spoiling the surprise for Akane and her family, I don’t want to reveal anything more – thus only telling “half” of the story here in today’s Forza Week in Review. For the rest of the story, please make sure to tune in to Verena’s show on March 1 starting at 10 a.m. Pacific, and look for more in an upcoming edition of the WIR. Now let’s get you caught up with the latest news in the world of Forza. "Over in Forza 7, we’re set to enter a new Leagues Season starting this weekend. Titled “Slushbox Slip” this season will feature Divisions like Forza P2, Formula 70s, Sport Luxury, and more. " 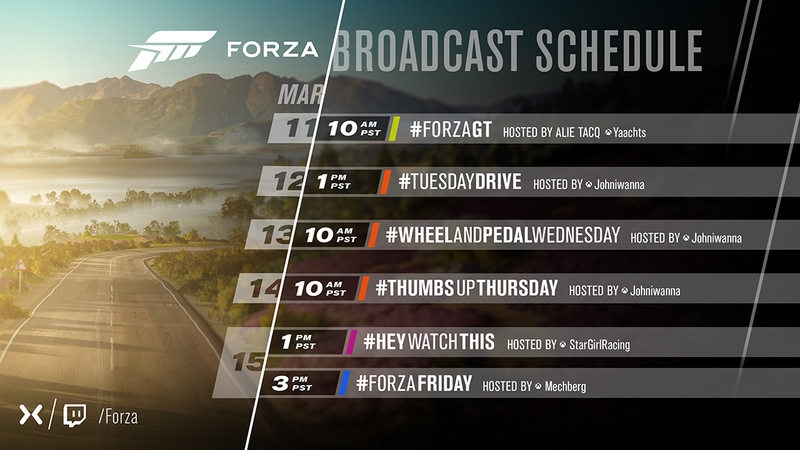 "We’re introducing guests to our weekly #ForzaFriday stream these days. Last week we had fun with Jon Knoles playing Forza Horizon 4 and Forza Motorsport 7, and this week we’re welcoming a name most Forza fans will recognize right away – Dan Greenawalt, the creative director for the Forza franchise. This will be Dan’s first appearance on #ForzaFriday in a long time, and your chance to catch up with Dan and hear his perspective on Forza in general, and ask some questions too. Join us starting at 3 p.m. Pacific on the Forza Mixer and Twitch channels." 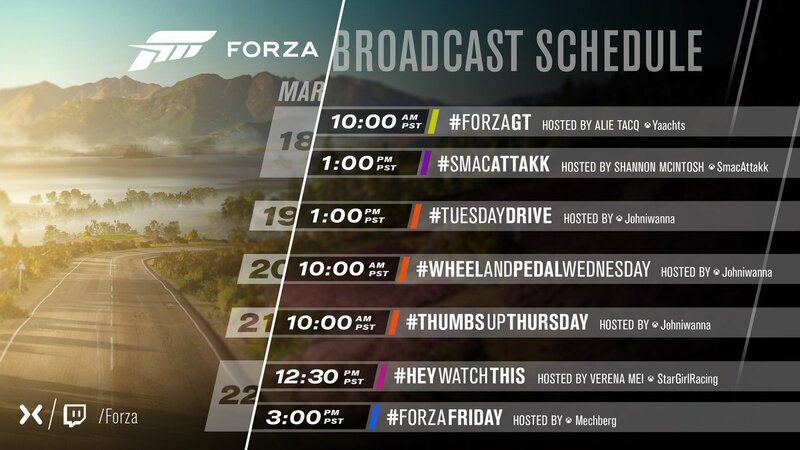 "Thanks to the talented art team at Turn 10 who created these cool promotional graphics for other Forza streams, including for Johniwanna and Verena, with more to come. You’ll be seeing these images beginning to pop up on Forza social feeds over the next few weeks." 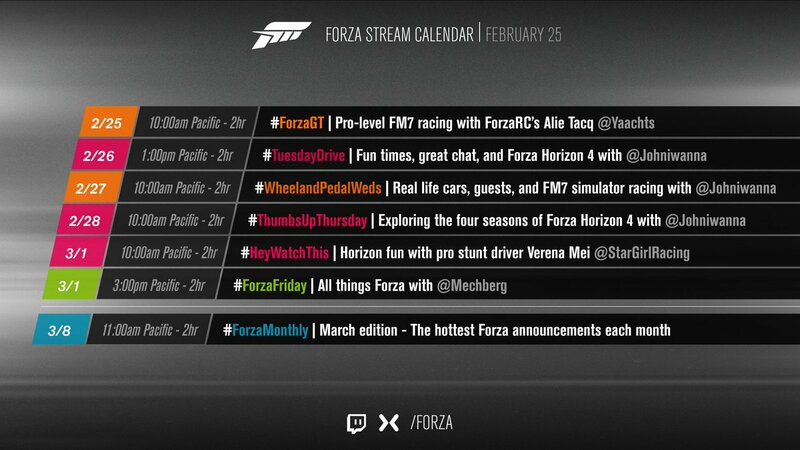 "The March edition of Forza Monthly is coming on Friday, March 8 starting at 11 a.m. Pacific. Look for more details on the show in this space next week." Driver Dave brings his Viper to Johniwanna's garage. Turn 10 CG Supervisor Matt Collins is Mechberg's guest, discussing his history with Turn 10 and track capture and design specifically. This week we’re tackling the winter chill in Forza Horizon 4, bringing you another update on the #TeamAkane project, and celebrating some of the amazing accomplishments by members of the Forza community. Let’s go! "Forza drivers – including some familiar Forza Racing Championship names -- have been out and about of late in competitions throughout the racing community. Congratulations to the Forza community’s own Raceboy77 for his win at the WorldGaming Pfaff Forza 7 Canadian Challenge, which was held in Toronto this past Saturday." "Congratulations also go out to the latest qualifiers of the American Sebring Round of the ongoing Le Mans Esports Series. Tune in for the next round of live Le Mans racing action on March 3 over at the Le Mans eSports Series Twitch channel beginning at 10 a.m. UTC." Earlier today, on Verena Mei’s #HeyWatchThis livestream on the Forza channel, viewers got to see a tribute to Akane Beardow – daughter of fifteen52 founder Brad Beardow. As I mentioned in last week’s edition of the Week in Review, Akane was recently diagnosed with Acute Lymphoblastic Leukemia and is currently undergoing treatment. It’s an understatement to say that the Forza community has come up huge in support of Akane and her family; especially the PTG community, who created an astounding tribute video that the team put together in support of Akane. The video aired on Verena’s show earlier today (be sure and watch the replay if you missed it the first time around) and features incredible video work and an astounding set of liveries created by the talented PTG artists, all dedicated to Akane and her ongoing battle. '"Have you ever wondered what Forza Horizon 4 would look like as a quarter-eating Arcade game? Or perhaps the better question is: What if Forza community creator Don Joewon Song created his own game? DJS took the question to its extreme with his latest video creation dubbed “Project Arcade.” Without giving too much away, DJS combines some skilled graphics work with his patented mix of incredible driving to create this fictional arcade Horizon game. As always with his work, this latest project needs to be seen to be believed: https://youtu.be/_5J-RzxpucU "
"On today’s edition of #ForzaFriday we’ll be welcoming Turn 10’s Matt Collins to the show to talk about his role with Forza, as well as work his team has done in recent updates for Forza 7, including the new paint space lighting options that were part of the February update. Matt’s one of the most entertaining people around so come for the interesting Forza tidbits, and stay for the laughs. It all begins at 3 p.m. Pacific – see you then!" 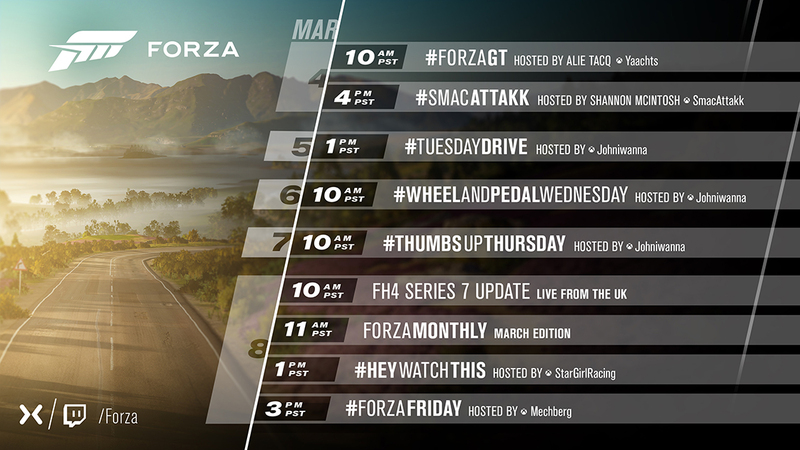 "If you love the Forza channel on Mixer and Twitch, make sure you’re locked in one week from today, on Friday, March 8. There’s a full lineup of streaming on the way, starting off with off with the latest update from Playground Games HQ which kicks off at 10 a.m. Pacific, featuring details on the upcoming Series 7 update for Forza Horizon 4. That will be followed by the March edition of Forza Monthly, which will feature guests from both Playground Games and Turn 10, including Forza creative director Dan Greenawalt. We’ll also be welcoming Formula Drift driver Chelsea DeNofa to the show to talk about some of the cool stuff we’ll have going on in March." Playground Games will kick things off with their Series 7 stream, originating from Playground HQ. Join PG’s Retro Krystal, Chris, and Andy as they take you through the upcoming update for Forza Horizon 4, which is launching next week. Right after Playground finishes their broadcast, we’ll be live from Seattle with the March edition of Forza Monthly, which features a full line-up of fun and great guests. Playground’s Mike Brown will be on hand to talk more about Forza Horizon 4’s Series 7 update, and we’ll be joined by Chris Esaki and Devin Carraway from Turn 10 to show off the March update in Forza Motorsport 7 (which is arriving on Tuesday, March 12). But that’s not all! We’ll also have two very special guests on the show – Formula Drift driver Chelsea DeNofa will be on hand to talk about his career and some cool stuff happening in Forza, and we’ll be joined by Turn 10 creative director Dan Greenawalt for a discussion on the creative process that drives Forza. In all, it’s going to be a jam-packed show that you won’t want to miss. 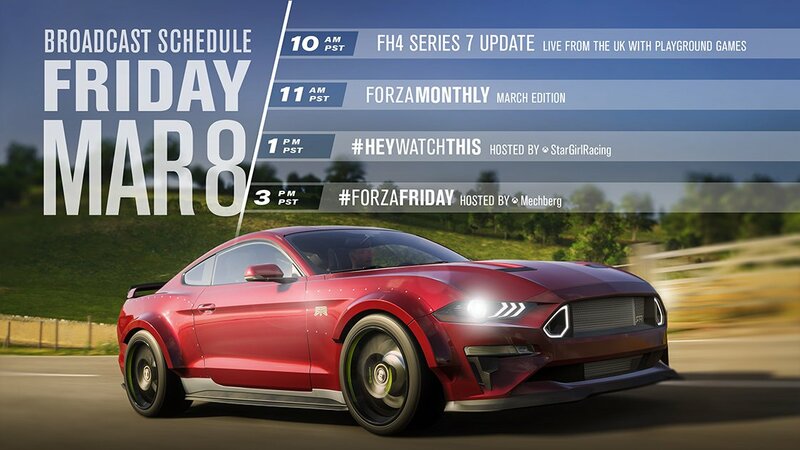 You’ll also want to stick around after Forza Monthly is over, because Verena Mei will be following up with her regular Friday show #HeyWatchThis, where she’ll be playing Forza Horizon 4. Last but not least I’ll be back at 3 p.m. Pacific for another edition of #ForzaFriday, talking about all the day’s news and hanging out with the Forza Community as we play Forza Horizon 4 and Forza Motorsport 7. Join us tomorrow on the Forza Mixer, Twitch, and YouTube channels for all the fun, beginning at 10 a.m. Pacific. Finally, here’s a quick look at next week’s streaming schedule. 63:30 - Chris Esaki talks March updates on Force Feedback and wheel controller response, tuning, and telemetry. Per-car settings. 95:20 - Dan Greenawalt and Chris Esaki talk about community feedback over the past year, and the future. "What we're saying very specifically is that Forza Motorsport 7 has had a strong amount of support from the team, and we're going to be shifting our weight. So there's still updates to come: you heard about Forza Race Regulations, and we're going to be coming out with a private and then public beta and then rolling that out; you know, we're not done with esports, that's an exciting part to us as well so we're going to be doing updates on that in the future. And of course we're going to be doing other updates to the game. But the weight of the team is shifting over to our next project. So we're getting into that concept phase." "I think the best way to think about, and how I think about, all the work that's going on now with Forza Motorsport 7 is that we have an eye to the future now. I talked a little bit about how Forza Race Regulations really are fundamental to how we think about the next iteration. We are pouring so much energy into making sure that we have this rock solid foundation around Motorsport. A lot of that has to do with online behaviors and play, rule sets and that sort of thing. So just to be clear about that, I view that as not just working on Motorsport 7 but working on future investment. That work is future investment for us. So I talked about the physics roadmap we have, I talked about the AI roadmap on previous streams... we have years - literally years of work here around so many different efforts and that's all future look. That's all about taking what we have today and how do those investments directly impact our next experience. So that's how I think about it. You'll still see so many things happening within FM7 because they will directly help us on the next product. So we're not just building off in some secret cave and all of a sudden we unveil at E3 and everyone's like 'oh by the way get it in a couple months,' and then people are excited about it but then they're like 'hey wait, this isn't what I was thinking it was going to be and my expectations are this or that.' But tow because we're changing everything about how we do this, FM7 is going to continue, that work is going to continue. And we're going to continue to listen to our fans, and that Discord channel is where it's all going to happen, or where we hope that most of it is going to happen. But this is also where the team is going to be looking for the inspiration and focus for the next version as well." "I think it's important to mention... we work in game development. What I love is that we can have an authentic discussion with the community whether you work in game development or not, maybe it's on Forza Fridays, maybe it's here, we can go deep and we can have discussions. I love that this listening to your fans, it's in all things in what we're doing. We want to be more reactive. Part of being more reactive is having better tools for how we can actually launch high quality features, and who we launch them to. So sub-communities; and that's what's great about Discord and other ways we communicate with people - we can create sub groups. We're doing Skype interviews with some of our fans, we've had panel interviews with pro drivers, and other things, to get feedback and get them invested in what we're doing. That's what we're going to continue to do. I mentioned tools. We have part of the team that actually makes tools for the other part of the team. And those are customers, those are fans of our game. And so shifting everything over to be fan first is not just kind of an idea right now, it's something we are pushing through every aspect of the team; how it's organized, how it works, how it talks. And as I said, I don't know how this is going to go. All I know is we're going to take this journey together. And we're going to be open, we're going to be honest, and find the right way to have this discussion with the fans at multiple levels and together we'll do something cool." Announced during the March 8 Forza Monthly livestream, Forza now has an official Discord server. The March 2019 update for Forza Motorsport 7 arrives on Tuesday, March 12! Drifters and wheel users rejoice, because March is bringing some great features your way. Not only do we have three drift-ready RTR cars serving as this month’s Spotlight Cars, we also have a new cockpit camera option made specifically with drifters in mind. We’ve also made some improvements to collisions in the game based off community feedback and have added new quality of life improvements for wheel players. The long-awaited Forza Race Regulations (FRR) feature makes its limited-release debut in Forza Motorsport 7 this month. See below for details on how the closed beta will work and when the general player base will get their first taste of FRR (hint: it’s in April). 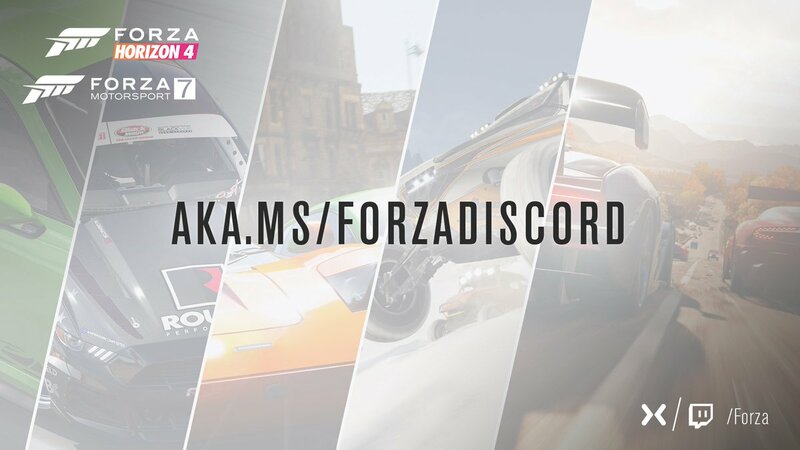 Finally, the official Forza Discord server is now open for business and we’re inviting the entire Forza community to join and let their feedback be heard. See below for more on how you can get involved with this new platform. As always you can see the longer list of fixed and improvements in our March 2019 Release Notes on the Forza Support site. Here are the highlights of the March update, starting with that trio of drift-ready, RTR-powered beasts. MARCH SPOTLIGHT CARS: WELCOME RTR! "This month we have three Spotlight cars that are known for getting sideways in some of the most thrilling drift competitions in the world. Driven by Formula Drift heroes Vaughn Gittin Jr. and Chelsea DeNofa, these RTR monsters are surely “Ready to Rock”! Each of these cars is available to all Forza 7 players for free this month." The rollout of Forza Race Regulations (FRR) begins this month. Starting in March, we are beginning to introduce FRR to Forza Motorsport 7 and this rollout will take place over several months as we continue to introduce new functionality and features to the system, and to listen to feedback from the Forza community. Beginning on March 13, we will be launching a closed FRR beta hopper that will be accessible to a small number of players, including Turn 10 developers and invited Forza Motorsport 7 players. During this closed beta, Turn 10 will be experimenting with the first version of FRR in a retail environment, and gathering feedback from invited players. The scope of the FRR feature set in the March closed beta will be limited to track cutting only and will feature UI elements and implementation aspects that are not yet final. For example, while players will incur time penalties for cutting the track in this FRR hopper, those penalties will not affect players’ final placement after a race has completed. Incurred track-cutting time penalties will begin to count towards event results after the April update. Also in April, we expect to open a public FRR beta hopper that will be accessible to all Forza Motorsport 7 players. Look for a more detailed explanation of how FRR features will work with the April update – as well as more detail on how FRR will evolve in the months ahead – coming next month. Collision Assist – In an effort to prevent players from using Collision Assist to push other cars around the track, the Collision Assist effect now bleeds off over time during contact. General Collision Improvements – We’re introducing some important changes to the collision model. Previously, the friction between two cars used a fixed coefficient. Introducing the new “soft” collisions in Forza Motorsport 7 meant that friction sustained over a longer period. With the March 2019 update, we’ve lowered the peak friction and added a scale to the friction coefficient based on the interpenetration of the soft collisions. This means that light bumps will have less friction and large-magnitude collisions, where cars “squish” into one another, have higher friction. We have also adjusted the amount of time that cars can be “squished” together. 1) Per-Car Wheel Tuning – Each car in a player’s garage now has a tunable setting for steering wheel rotation scale and force feedback. Players can now set their steering lock with soft locking and steering force, and those settings will save to the garage car. Note that this feature is not usable on rental cars and does not save to the tune itself. This tuning menu is accessible from the Tuning & Upgrades menu. 2) Dynamic Damper Behavior – The recently updated force feedback (FFB) introduced a dynamic damper to FFB. Some players prefer a linear damper; as a result, we’ve introduced a new dynamic damper effect slide which allows players to scale between the current dynamic damper and a fixed linear damper. The existing damper scale still scales the damper as it did before. 3) Load Sensitivity Tuning – The current FFB system in Forza Motorsport 7 is based on actual wheel loads. Some of these loads occur at a higher frequency. The game filters the very high frequency loads and bucket them as “Road Feed.” Some medium frequency loads are bucketed as “Align Torque.” The new Tire Load tuning setting allows players to filter out the medium frequency load to create a smoother FFB experience. 4) Wheel Telemetry – We’ve added a new panel to Telemetry to show players their current steering wheel torque in graph form. Because the game sends FFB torque, damper, and spring to the wheel separately, the game cannot display the actual level of torque saturation for the wheel. Torque is displayed as it is sent to the wheel, a normalized scaled between 0 and 1, with 1 being the maximum. Spring and Damper are normalized to the default setting. With the March update players can now find the Track Limit Lines settings option under Assists. Track Limits settings can also still be accessed via the HUD options menu. Together with the introduction of new RTR cars in Forza Motorsport 7, we’ve got a new drift-focused cockpit camera option that is designed to improve drifters’ in-car views. Accessible from the HUD menu, the Drift Camera is a toggle-able option that, when engaged, allows the cockpit camera to automatically look in the direction of the car when drifting. The new camera option is available in both cockpit camera view and wheel-less cockpit view and features three different settings that players can tune to their liking. Sensitivity controls the ratio of car angle to camera angle. Players can increase or decrease this setting to affect how sensitive the camera is to car angle. Look Speed controls speed at which the camera moves from its original position towards the direction of travel. Reducing this setting will smooth out the camera’s movement due to changes in direction. Camera Range controls the width of movement for the camera. Reduce this setting to limit the camera’s movement when the car is at peak angle. Got something to say about Forza? Want to share some feedback about the new Drift Camera setup, or Wheel Telemetry? Can’t wait to share your thoughts on Forza Race Regulations? Check out our newly opened Forza Discord server. 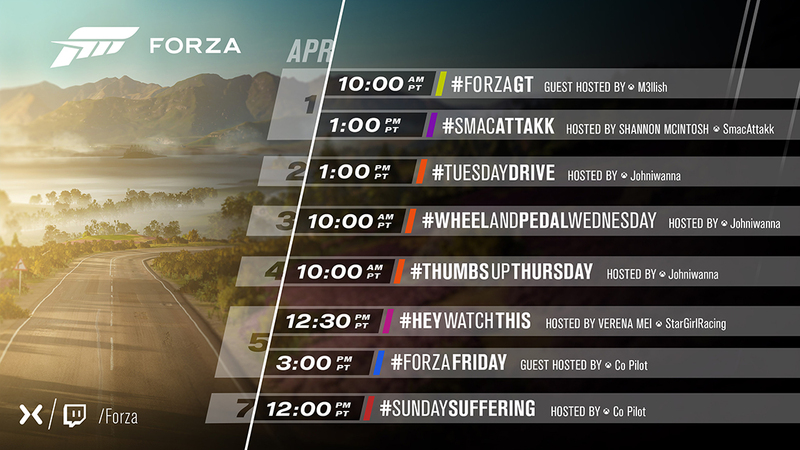 Here you can interact with Forza fans from all over the world and share your thoughts on all things Forza. Join the fun now and let your voice be heard! Turn 10 Art Director Tim Dean visits Johniwanna's garage to talk paint detailing for his Porsche 911. Mechberg talks to Chris Esaki about his career, FM7, and Forza Race Regulations. Coming off the back of a huge day of streaming on the Forza channels last Friday, this week we saw updates in both Forza Horizon 4 and Forza Motorsport 7. 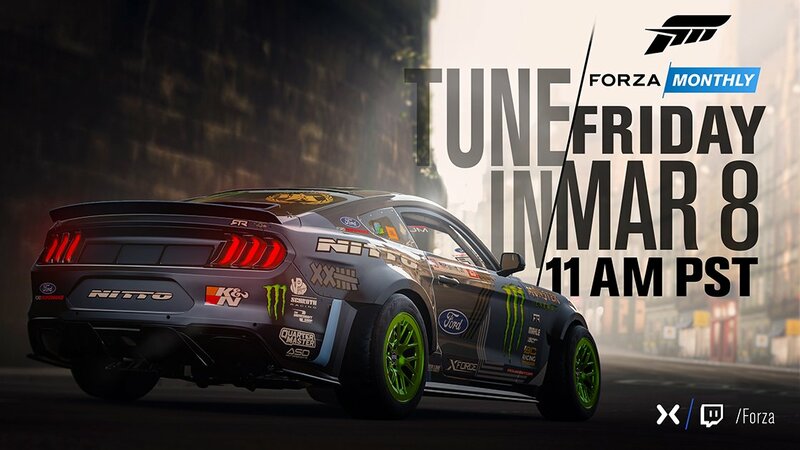 "Over in Forza Motorsport 7, the March update launched on Tuesday and brought three new RTR Spotlight cars: the Spec 5 Mustang, as well as the drift cars piloted by Formula Drift pros Vaughn Gittin Jr. and Chelsea DeNofa. Alongside the cars, the March update also featured a new cockpit drift camera, collision improvements, and some wheel settings changes that you can learn more about in our March update announcement story." "Perhaps the biggest news for race fans in March is the first appearance of Forza Race Regulations (FRR) in the form of our closed beta hopper. As we outlined in the announcement story, this private beta is just the first step in rolling out the FRR feature set over the coming months. Our plan is to open the public FRR beta hopper in April, so look for more information about that soon. In the meantime, if you want to see how FRR appears now versus how it will appear after the April update, check out last Friday’s episode of Forza Monthly (the video demo begins at the 1:24:26 mark)." "The FRR journey has officially begun in earnest and I’m looking forward to hearing from players as it continues to evolve. As always you can share feedback with us on any Forza social channels, on the Forza Forums, as well as on our recently opened Forza Discord channel." "The March edition of Inside Xbox aired earlier this week, featuring a celebration of Women in Gaming across Xbox and the industry (if you looked closely during the show’s intro, you might have recognized Kari and Jenn from Turn 10; each of whom have made recent guest appearances on Forza Monthly!)" "You might have also seen a segment with Xbox’s Kareem Choudhry talking about the latest news on Project xCloud – the Xbox game-streaming technology that is meant to complement console hardware and give gamers more choices in how and where they play. Alongside important updates on when public testing will begin, the segment featured host Julia Hardy playing Forza Horizon 4 on an Android phone and Bluetooth-connected Xbox controller, via the Project xCloud service. Check it out:"
"eSports racing team announcements don’t get much bigger than the one made by Red Bull eSports Racing Team earlier this week. Three of the heaviest hitters in previous Forza Racing Championship seasons – including Zach Taylor (aka Venom), Robin Betka (aka bbbb0x) and 2018 ForzaRC champion Aurélien Mallet (aka G2 Laige) – are joining the Red Bull team as part of its racing eSports program. This is surely one of the strongest driving lineups in eSports racing history and it will be fascinating to see how other Forza teams react, as well as how these three drivers gel on the track once green flag has dropped. Stay tuned!" "I’m happy to be joined by Turn 10’s Chris Esaki on today’s edition of #ForzaFriday. We’ll be recapping last week’s “Forza Monthly” show and checking out the the Forza Race Regulations beta hopper, as well doing some racing with viewers. Join us for the fun, which starts at 3 p.m. Pacific on Mixer and Twitch." "Finally, get ready for another great week of fun on the Forza channels next week." "Let’s start with something pure and joyful in this edition of the Forza Week in Review. In practically every WIR story we celebrate the great work of the Forza community in one way or another. Whether it’s showing off photo contest winners, or talking about great collaborations like the recent #TeamAkane tribute from the PTG team, there’s always great stuff happening. But in my time here at Forza, I don’t think I’ve ever seen anything quite like this: a miniature stop-motion masterpiece featuring the Forza livery tool and the masterful abilities of creator PTG FOX. If you haven’t already seen it, check this out: https://youtu.be/2pihYMvNzdg A month-and-a-half of work, 656 screenshots on Xbox, approximately 43,000 layers in the livery tool… and he wrote and performed the music as well! Congratulations to PTG FOX on a newly minted Forza community classic!" "How’s your drifting looking this month? Between the new drift cockpit camera and the new RTR cars, there’s no better time than now to practice getting your favorite cars sideways. Even doubly so because of our ongoing Drift Bounty Hunter event, where you can pit your drifting skills against the likes of Team RTR pros Chelsea DeNofa and Vaughn Gittin Jr. (GTs: ChelseaDeNofa and VGJXX5, respectively), as well as Turn 10 developers Aaron Brooks and Devin Carraway (GTs: Euro Nation and SpaceLionDC). The current world #1? That would be JSR AziDhk, who has posted an astonishing 102,370 points on the Dubai Mountain Circuit as of this writing. Can you beat that score? Maybe not. More likely than not, however, there’s someone on your Xbox Live Friends leaderboard that you can knock off. So find the “Drift With the Pros” event under the Featured Events Rivals channel and get to sliding!" "If you missed last week’s edition of #ForzaFriday you missed a great conversation with Forza Motorsport design director Chris Esaki. Today we’ve got another fun Turn 10 guest lined up – senior developer Mike Grodin, who will be making his first appearance on Forza streams. We’ll be chatting about Mike’s role at Turn 10 and playing Forza Motorsport 7 with viewers, so make sure you’re around to get in on the conversation, ask questions, and join in on the racing fun. It all begins at 3 p.m. Pacific on the Forza Mixer and Twitch channels." 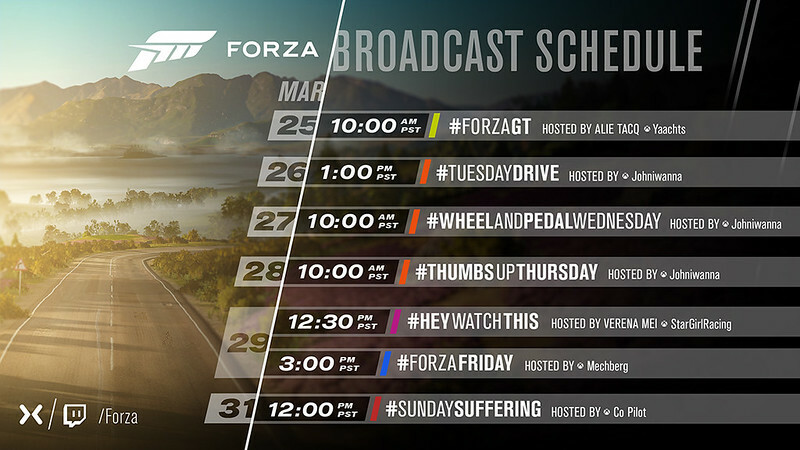 "Before we head out for the weekend, here’s a look at what’s upcoming next week on the Forza channels, including the debut of our new Sunday show featuring our very own Co Pilot, who will be taking viewers along on her journey towards "git gud" status in Forza. The adventure begins with "Sunday Suffering," debuting on Sunday, March 31!" Guest Derek Walker brings his 1973 BMW Bavaria to John's garage. Guest Mike Grodin talks about his role at Turn 10, feature development process, and monitoring community feedback. This week we’ve got news on events in Forza Horizon 4 and Forza Motorsport 7, the latest qualifier for the Le Mans eSports series, and a brand-new streaming show debuting this weekend on the Forza channels. Ready, set, Review! "The big news for Forza Motorsport 7 is next week’s April update, which launches on Tuesday, April 2. We’ll have more details on what’s arriving with the update -- including the next stage in Forza Race Regulations evolution -- here on FM.net on Monday." "Feeling quick? The final Rivals qualifier for the WEC Le Mans Esports championship is now open in Forza Motorsport 7! You can find the event in the Featured Events channel of Rivals under the name: “LMES Qualifier RD 6.” This time around you’ll be truly challenged with the 1967 Ferrari #23 Ferrari Spa 330 P4 on the legendary Spa-Francorchamps circuit. The Spa round of qualifying and racing is the last chance for hopefuls to qualify for the Le Mans Super Final, which will take place in June alongside the real 24 Hours of Le Mans race. For more information check out the Le Mans Esports series page. Some of the fastest drivers in the world will be competing for their share of the $100,000 prize pool, so prepare yourselves and your lap times accordingly, and good luck!" "Today we’re welcoming Kristina Rothe (GT: Drawing Curtain) to #ForzaFriday for the first time. Kristina has been with Turn 10 for a few years now and just recently joined the Community Team as producer. I’m overjoyed to add her expertise and passion for community to the team as we plan great things ahead for the Forza community. On today’s show we’ll be talking about Kristina’s career and the various Forza features she’s worked on during here time here at Turn 10 and, of course, we’ll be playing Forza with all of you as well!" "Elsewhere in the streaming world, our own Co Pilot is kicking off a brand-new show on the Forza channels this weekend. “Sunday Suffering” premiers on Sunday, March 31; here’s more about the show from the host herself: ... #SundaySuffering will be every Sunday at noon Pacific (8 p.m. BST) – 2 p.m. Pacific (10 p.m. BST) on the official Mixer and Twitch channels! Not so great at Forza? Want to improve? Come get good with me!" John's friend Tyler brings his 1980 Ford Fiesta to the garage, next to John's "Old Man Tan." Guest Kristina Rothe talks about her life in Europe before becoming a producer at Turn 10. - #InsideXbox April edition (TBA). Last year's April episode (on the second Tuesday) provided info about Xbox FanFest at E3.